Wacky Races © 2008 Banpresto. 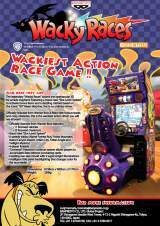 Wacky Races is an officially licensed racing game based on the popular cartoon series. It features 11 licensed vehicles, 23 licensed characters, and 6 tracks including Frosty Mountain, Urban City and Grand Canyon Desert. The game uses a password system to save your individual game data. Runs on the "Taito Type X²" hardware. Released in February 2009 in Japan (even if the titlescreen says 2008).